To play or pause the video, tap the Play/Pause button. To adjust the volume, drag the volume slider to the right to raise the volume and to the left to lower it. The volume adjusts relative to how the physical Volume buttons are controlling audio levels. To restart or go back, tap the Restart/Rewind button to restart the video, or tap and hold the same button to rewind. To skip forward, tap and hold Fast Forward to advance the video. Or skip ahead by dragging the Playhead along the Scrubber bar. To set how the video fills the screen, tap the Scale button, which toggles between filling the entire screen with video or fitting the video to the screen. Alternatively, you can double-tap the video to go back and forth between fitting and filling the screen. Fitting the video to the screen displays the film in its theatrical aspect ratio. Again, you may see black bars above and below the video (or to its sides), which some people don’t like. The bars on the top and bottom are an example of letterboxing; on the sides, it’s pillarboxing. Filling the entire screen with the video may crop or trim the sides or top of the picture, so you don’t see the complete scene that the director shot. To select language and subtitle settings, tap the Audios and Subtitles button. You see options to select a different language, turn on or hide subtitles, and turn on or hide closed captioning. The control appears only if the movie supports any of these features or if you’ve turned on closed captioning by choosing Settings___Video. To make the controls go away, tap the screen again (or just wait for them to go away on their own). 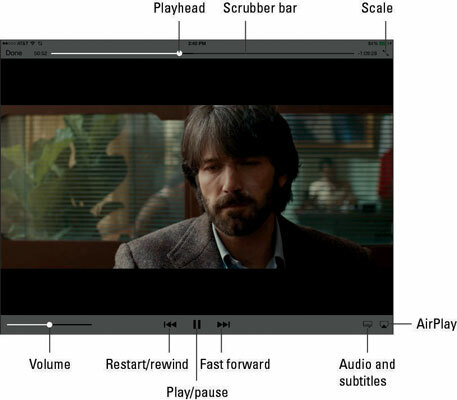 To tell your iPadmini you’re done watching a video, tap Done. You return to the last Videos screen that was visible before you started watching the movie.